Whether you like it or not, flossing needs to be an essential part of your oral healthcare routine. Normal brushing alone only reaches 60% of the tooth surface. So, what tools do you use to floss with? There is the traditional string floss, or there are the floss tapes/ribbons. You have interdental brushes but you do have water flossers too. If this is the first product you’ve looked at, you may like to check out our best cordless water flossers post, or our best Waterpik 2019 post, otherwise continue reading for our full Waterpik Cordless Advanced review. What is the Waterpik Cordless Advanced Water Flosser? It is a handheld device that is made up primarily of a pump and a reservoir. In the reservoir you place water and when powered on, the pump draws the water out and feeds it through a tube at the top of the flosser into the user’s mouth. A powerful jet of water, it forces plaque and bacteria off and away from the teeth and gums. Where’s the best place to buy it? Typically we tend to recommend Amazon because it is very competitive on price and has special offers running. It also offers free delivery. However, it’s always worth checking out other retailers as well. Below we have listed a price comparison for US retailers stocking the Waterpik Cordless Advanced. It’s always worth checking eBay too. Here is a video demonstrating how to use it. Whilst you tend not to see water flossers on the shelves of your local grocery store like you do string floss, you do in many respects still have a lot of choice as to which to go for. Corded and cordless flossers exist. Some have more pressure settings than others whilst some have more in the box. The Cordless Advanced from Waterpik is at the top of the range for cordless options. As the name implies, this is a cordless option with a built in rechargeable battery. It gives all the basics features you require and then some. Produced by the leading brand within this water flosser space, the experience you get from this Waterpik product is fantastic. The difference between these 5 are the color and nothing else. Here are a list of the pro’s and cons having used the Waterpik Advanced Cordless water flosser. Effectiveness & appeal – It takes a little practice to floss effectively and without making a mess, but it is a more comfortable and enjoyable way to floss or many. Water resistant – Can be used in the shower. ADA accepted – The American Dental Association (ADA) have given this their seal of approval. Price – It is not ‘cheap’ alternative to regular floss, but long term convenience is worth something. Before I get into the details of the Cordless Advanced flosser specifically, I want to ensure you are familiar with the styles of flossers. Water flossers come in 2 styles, corded and cordless. This is a cordless option, which means you can move without restriction as the unit works independent of mains power. The built in battery and water tank mean you are not physically tied by a cable to the wall. Cordless are particularly popular because they are easier to travel with. As you might have guessed, the corded options require electricity, from the mains to run and do not allow the same degree of movement and flexibility. Normally larger, they take up more work surface space. But, there is a trade off between these 2 styles and I feel you need to really asses your lifestyle and which is right for you. Cordless is great, if you travel a lot or do not have power in your bathroom. They also take up less space. However, they can be bulky and might be the first thing to consider leaving behind if you are going away for the weekend with only a small bag. A lot of this size is impacted, because they do have to hold a volume of water to work. Some feel they do not hold enough, or the flossing time is not great. The countertop options offer longer usage time, more power options and tend to overall be better value for money. Both have a place. But if you like to spend lots of time getting your teeth perfectly clean, there may be frustrations that come about from such a cordless option. With that brief summary covered let’s take a closer look at the Cordless Advanced. It comes in 5 different color options. As you might expect, the more standard White and Black are most popular and sold in more places than all the other options. Typically, the White and Black are a few dollars cheaper, but that is not always the case. The unit is not small, but it does have a 210ml/7oz water tank built into it. It is quite curvy in the shape which is nice and makes it a little more comfortable to hold in hand. When you look at the unit face on, it is the main button/control panel that stands out at you. A power button sits at the top, with a pressure control button below. Underneath these are the words High, Medium and Low, stacked on top of each other with an LED between them. The LED below each pressure setting lights up once selected. Below this is a battery status icon and LED that gives feedback on the battery power. All of this is framed with a Silver bezel/trim that is shaped in a stretched teardrop sort of shape. The remaining body of the unit is a smooth touch plastic. At the front, just before the base of the unit is the Waterpik logo. Flip the unit round and half of the back is made up of a transparent plastic with a cover over the opening to the water tank. The tank holds 210ml/7oz of water and will give up to 45 seconds of usage time. On the upper half of the back of the unit are a series of raised dots that act as a grip for the fingers to keep the unit firmly in hand. 4 nozzles come provided in the box. These can easily be removed and replaced by releasing the catch that holds them in place. There is an eject/release button on the back of the unit, right at the top. All the nozzles can be rotated a full 360 degrees, so that when in use you can get maximum benefit from the flosser and position the tip in the mouth at the ideal angle. Coming in a little storage box, it is a neat way to stow the nozzles when not in use. For the vast majority, the classic tips are the best option to use. If you wear braces, then the Orthodontic tip is useful, whilst those with dental implants will find the plaque seeker tip most useful. There are 3 additional styles of nozzle. Designed for different use cases. The Pik Pocket tips are specifically designed for those with Periodontal Pockets. Any of these styles can be purchased and used with the Cordless Advanced. You can find more information on each of the different tips here. Do remember to replace the classic and tongue tip every 6 months and all others every 3 months. As suggested in the pros and cons section of this review, the way in which the Waterpik cleans is both a blessing and a curse. There are 3 pressure settings available on this unit, whereas countertop units can have up to 10. This means there is some control in the intensity at which the water flows from the reservoir, from a soft to a more invigorating clean. Traditional string floss can often feel a more harsh and aggressive cleaning option, particularly in tight gaps. Water flossing is not always a replacement to regular flossing, but an excellent complimentary approach. Consult with your dental professional to see what tools are right for you. Using a water flosser does take some getting used to and practice. You need to be lent over a sink to floss properly. If you have not used one before, expect to take a few days to get used to it. You may well make a mess in the process. When you fill the tank, the idea is you fill it with water, this can be cold or lukewarm if you prefer. The advised is the warm water. You could add a dash of mouthwash too if you wanted an extra burst of freshness. Once powered on the pump inside the flosser will draw the liquid from the tank up and out through the nozzle on the top. It does this in a constant stream until the power is turned off or the liquid runs out. Choose the pressure setting you want. Lean low over sink and place the tip in mouth. Aim the tip toward teeth, and turn the unit on. For best results, start with the back teeth and work toward the front teeth. Glide tip along gumline and pause briefly between teeth. Continue until you have cleaned the inside and outside of both the upper and lower teeth. Direct the jet stream at a 90-degree angle to your gumline. Slightly close lips to avoid splashing but allow water to flow freely from mouth into the sink. Keep unit upright during use for best results. Whilst you purse your lips around the nozzle and aim to retain as much of the liquid in your mouth as possible, the resulting flow does mean you will be forced to dribble the excess liquid out. Once you have perfected the technique not only does it become easier, it’s less messy too. A full tank will give a maximum of 45 seconds cleaning time. If you wish not to refill, you will need to perfect the technique and the time to run the flosser around the teeth and gums. Having used water flossers before, I have had a bit of practice, but initially that 45 seconds is not enough time and you normally need to refill once or twice until you get more comfortable with daily use. There is no timer or pacer built in. Children from the age of 6 are supposed to be able to use this, but their smaller mouths would struggle with the amount of liquid. The flow is quite quick and it is only a matter of seconds before your mouth is full as an adult. As the unit itself is water resistant, you can actually use it in the shower if you choose. There are many who question the effectiveness of flossing and the need for it, but it is still a recommended daily practice. There has been lots of research by Waterpik to show their effectiveness. A study by Guror in 2009 found just a 3 second treatment can remove 99.9% of plaque biofilm amongst other research documented on the Waterpik clinical research pages. 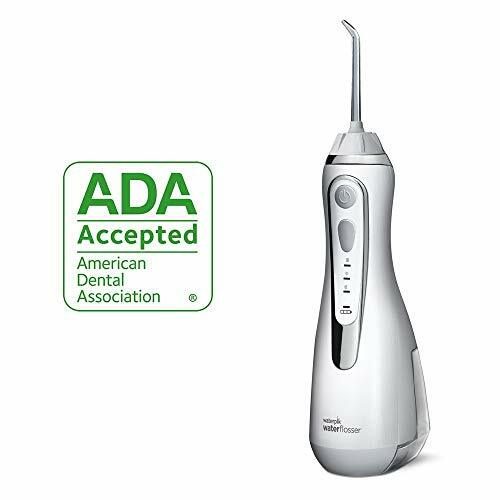 The effectiveness and suitability for a water flosser as part of your daily healthcare routine is given further credibility by the American Dental Association (ADA). This and other Waterpik flossers have been awarded their ‘Seal of Acceptance’. I found that I preferred the more powerful setting of the 3 offered, but those with sensitive gums may find the lower power setting to be better. The pressure ranges from 45 to 75 PSI. Despite my preference for the more powerful option, my mouth did feel clean after use, although I did also feel that I had washed away any good that the toothpaste I used in the brushing session prior had been washed away. A solution to this problem, if you tend to floss after brushing like me, is to floss beforehand. This type of flosser is also great for those with braces where normal flossing feels almost impossible, unless to take a lot of time and effort. It also works extremely well for those with sore or inflamed gums as a result of the early stages of gum disease. In fact it works so well that Waterpik offer a 14 day money back guarantee. If after 14 days of daily use you are not completely satisfied that this product has reduced the symptoms associated with gingivitis, you return this to the manufacturer for a full refund. Pretty good hey! The rechargeable battery inside the unit will give approximately a weeks use between charged, based on a 1 minute clean per day. It can be recharged in just 4 hours, using the magnetic charging cable. Read more about this in the ‘Battery Life’ section of this review. For those who want to travel with this cordless flosser, it comes with a drawstring travel pouch and also a plastic travel plug to fit into the nozzle to stop leaks when on the go. The cordless and lightweight design does make this portable, but I do question whether you would want to take this away with you if you are taking only a small amount of luggage. Whilst not huge, it is bulky enough that you will find yourself questioning, can I do without this for 3 days on my long weekend break. Built in and sealed inside the unit is a rechargeable battery. It will offer approximately 1 weeks usage time between charges, based on a 1 minutes use each day. On the front of the unit is a battery status icon, that gives some feedback on the remaining charge. When the battery is in need of a charge, with around 30% power remaining, the charge/battery indicator light will blink 8 times quickly after use to indicate that you should recharge the unit. To recharge it, you need to connect the power adapter that comes with the unit. One end connects to the socket, whilst other, magnetises to the front of the unt. It’s a clever solution and is a little less fiddly than some options. The charger just clips on and easily pulls off as and when it needs charging. It takes 4 hours to charge the unit. Do not use it, whilst connected to the power. Disconnect the charger and then use. It would have been nice if the battery lasted longer, a week feels a bit on the short side. If you are travelling for longer than a week, you will have to take the charger. The good news is, that the plug has a 2 pin US connector, but it does come with 110-240v support. If you travel, particularly overseas you need only worry about a plug adapter, rather than a voltage adapter. I have not suffered with any reliability issues with the unit, but some have reported poor performance and reliability issues with the battery. In this unit is a Nickel Metal Hydride (NiMH) battery. Lithium-Ion batteries (Li-Ion) do tend to be more popular, reliable and offer better battery life. It is a shame that Li-Ion has not been used here, given the price of the unit. Don’t be too concerned about this, I think the cases have been relatively isolated and are usually covered under warranty. This comes with a 2 year warranty. You can buy direct from Waterpik, but you will be paying full price. Shop around and the prices vary a little – we have included a live price comparison here. At the time of review, the lowest price I could find, was just under $70. Most stores were selling around the $80 price point. Prices do vary between the color options, with the Black and White appearing to be the cheapest most of the time. Compared to regular tape floss this my seem quite expensive and to be fair it is. Waterpik have other cordless flossers, such as the AA battery operated WF-03 that sell for half this price. From a sheer value for money perspective, the cheaper models are better value. For many, the extra price is hard to justify and to some extent I agree. However, the WP-560 offers a larger reservoir, extra pressure settings, a rotatable nozzle and a built in rechargeable battery. Those extras require an extra spend. As ongoing costs go, you need not worry about the cost of replacement batteries, as the battery is built in. There is of course the cost of the electricity to charge it, but this should be just a few cents over the year! You do need to consider in the price of replacement nozzles. The nozzles are the same whatever Waterpik you go for. A pack of 2 costs about $10 and last about 6 months, so at $5 each they are fairly good value. It does add to the lifetime cost, but you have this with other water flossers too. Retailing for an average price of $80 online and factoring in 2 packs of replacement heads at $10 each, the cost over 3 years works out at $100 or 6p per day. Compare this to traditional string floss that works out at about 2-3 cents per day and it’s about 3 times more expensive. It is without doubt a luxury and by no means essential, but the time saved, the simplicity and potential health benefits for many make this a worthwhile investment for some, but consider whether the cheaper alternatives are better for you. Waterpik have for many years been producing water flossers, both corded and cordless. Their history within this field means that the products are typically well built and reliable. Some have complained about the battery within this unit. Nickel Metal Hydride, rather than the more desirable Lithium-Ion. Whilst I have not suffered any issues during my testing, a few have raised concern over the quality and reliability. When you are paying this money for a flosser that should not be something you wish to worry about. That said, it comes with a 2 year warranty, that should cover any units that do fail. There are a lot of positives to this cordless water flosser and I do believe that this is the best in class. It performs well and is for many, myself included, a more enjoyable way to floss. A good box contents, adjustable pressure settings and ADA approved all contribute. There are some inherent limitations by the cordless nature and whether you can live with these will depend very much on your lifestyle and needs. Price however is the sticking point. It does not come cheap. Whilst the more innovative and desirable of the cordless options, it does not represent the best all round value. The WF-03 might be a better choice for some wanting to save a few dollars. Based on 1 user per day you will get about 1 week from the flosser. Yes. The 2 pin US magnetic power adapter attached to the front of the unit and charges it within 4 hours. Nozzles should be replaced every 6 months if using the classic or tongue cleaner. All others should be replaced every 3 months. Can I use mouthwash in the Waterpik? Approx 7oz/210ml which will last for 45 seconds. Do you own or have you used the Waterpik WP-560 Cordless Advanced Water Flosser? Waterpik vs Sonicare Toothbrush: How Do They Compare?